This is an English translation of the interview I did for Rutage, a Russian London lifestyle magazine. The original can be viewed here. GAVINO DI VINO: I OPENED RUSSIAN UP FOR MYSELF! 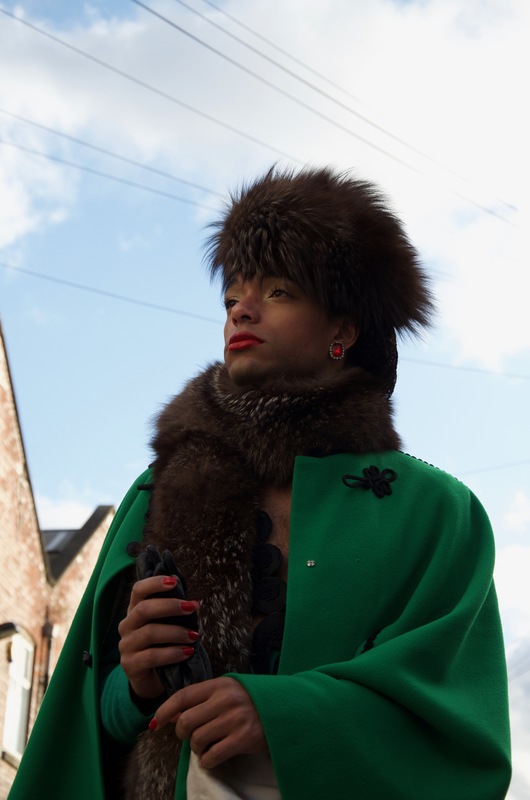 He describes himself as a fabuloska, a Russian word he created derived from the English ‘fabulous’. And believe me, there is no better word to describe him. We met in a private member’s club at the Royal Academy of Arts and spoke about the Russian language, its literature, his travels throughout the country and his life in London. Gavino di Vino: actor, fashionista, language student and a great fan of Russia. My name is Gavino di Vino, but my name on official documents is a little different! I was born in 1994, on the Wirral, which is an attractive little peninsula next to Liverpool in the north of England. You wouldn’t believe that even amongst English people, very few know where it is! I moved to Seven Sisters six months ago, and sometimes when I speak to my Russian friends, I like to translate it literally as “I live in Semi Sestrakh!” (‘seven sisters’ in Russian). When we met at a dinner in the hotel Café Royal, you ran down the stairs and shouted in Russian “The champagne is finished in this place! Where’s my carriage? The fabuloska is leaving!” What was that all about? Do you remember when you first found out about Russia? Do you remember the exact moment? And you decided to study the Russian language and culture? In college, when I was studying history, one of the courses was called ‘Revolution and Dictarship’ – this was obviously an introduction to the period in which that very notorious leader from the mid-20th century was in power. After that, having watched the British 2012 film Anna Karenina, I opened up for myself the world of pre-Revolutionary Russian high society – the world of Catherine the Great, balls, spectacular toilettes and those famous people who spoke brilliant French amongst their worldly acquaintances. At that time, I was also studying French, which is why it seemed a natural choice for me to apply to university to study Russian (and Spanish). Who else studies on your course? Do they have interesting motivations? The majority of the students on my course are also from England, but there is a notable number of young people from Europe. Some of them enjoy the linguistic challenges Russian presents, but others, like me, are absolutely enamoured with the mystery of this culture. When did you visit Russia for the first time? What impression did it give you? The first time was in 2015 when I went to Kazan with university. I found it quite interesting, but I think I had my first real soul connection with Russian last year, when I travelled to several fascinating places. For example, in Moscow, I stayed at the legendary Hotel Metropol, then at a dacha in Sergiev Posad, visited Torzhok, a small city in between the ‘two capitals’, hosted by my friend’s family, and saw St Petersburg with my own eyes. Every day in Russia something unbelievable happened to me, and I couldn’t help but cry “Only in Russia”! I feel that the ‘Mother Russia’, about which the great writers of the 19th century wrote, still exists. Did Russian show her romantic side, like the one that is so well written about? I was there from the end of August to the beginning of September, which was the perfect moment to be there – you could enjoy the feeling of a gorgeous Russian summer’s day and the rustling of the leaves in an autumnal breeze. The most romantic moment was in Torzhok, when I was playing in the garden with two little boys and revelled in the joy of being able to chatter with them in their native language. And on that very evening, we had a Russian supper, during which I even drank samagon! (Russian homemade vodka). In St Petersburg, I caused a real stir, almost to the degree of our beloved Madame Karenina. At the opera, the security guard was astounded by the extremity to which my toilette reached. In fact, I had so many moments like this which I could go on describing for a long time, which is why I decided to write a book about my Russian travels. Marquise de Custine’s, a French aristocrat I learnt about who wrote about his trip there in 1843, inspired me to write it in a grand 19th century style. In London, do you also meet Russian people and attend events with them? Of course! One of the best things about living in London is that it’s such an international city. Recently, my friends from Moscow arrived in London to present their brand Amova Jewelry and invited me to their fashion show at the Cuckoo Club. The hostess spoke to me in Russian, as did the rest of the guests, all gathering together in this little corner of the Russian world. A similar situation occurred at the W Hotel in central London, where I met a Russian DJ. He played Russian music, surrounded by Russian vodka… A home away from home! And do you have Russian-speaking friends? по-русски? !» (“Of course I speak Russian! Tell me, darlings, who in London doesn’t speak Russian? !”), and this became my first appearance in Moscow-London society. Interesting. And could you tell our readers why your image can be seen on the advertising billboard in Piccadilly Circus? Ah! Interesting question. I performed my show AUNTIE as part of a cabaret event in Camden – a tragicomedy about an African family, in which I play both the mother and her son. Producers from BBC were filming there that night for their documentary Queer Britain, and asked me to answer some questions about my upbringing in England. They obviously liked what I had to say, because afterwards they sent me an email asking if I wanted to become the face of an upcoming BBC 3 campaign. And you already know my response! Et voilà, I became a semi-permanent guest of Piccadilly Circus. At the moment, I’m at the very end of my university course, so there’s much studying in the library taking place! Besides that, I’m writing my first short short film about a family funeral, at which I realised many things about myself, and where, despite all difficulties, I managed to meet a very important person. After I graduate, I’m going to act on the London stage, and hopefully, we’ll see me perform around the whole world. I’m already planning to write a play in Russian so it can be performed in Moscow – my most favourite city in the world! I’m told that you’re an event host. Have you had the chance to host events in Russian? And if so, how can someone get in touch?